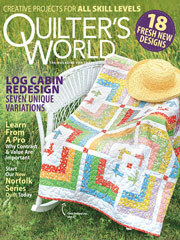 Log Cabin quilting patterns remind us of simpler, easier times. Start stitching this free pattern and add some homespun charm to your decor. The colorful and vibrant apple prints used are delightful! Size: 56" x 71". Block size: 15" x 15".